Clear blue water, a golden beach, a picturesque little island on the horizon, and in front of you dishes that smell of love, passion and 30 years of experience in the kitchen. 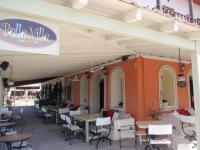 This wonderful french arabic stylish bar restaurant is located on the beach of Skala Eressos in Lesvos island. It overlooks the magical water of the Aegean sea with a magnificent view along the coast, from the little picteresque harbor to the famous Sappho Rock. In the heart of the famous beach of Skala Eressos the Turtle Canteen appears like an oasis. The canteen is located next to the "Psaropotamo" wetland and river, where it is kept company by other patrons of the area, such as ducks and migratory birds who all enjoy the beautiful scenery. 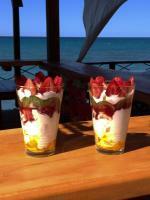 The new beloved habit arrived last summer for the first time in Skala Eressos, and hears the name "Pagothiki"! 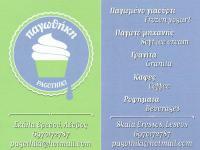 From frozen yogurt and traditional ice cream, to sorbet and coffee, "Pagothiki" is an iced summer addiction. Parasol Art Cafe Cocktail Bar will become your favourite hang out while you are in the island of Lesvos. One of the best beach bars, Parasol has a colourful decoration, inspired by Latin America and Caribbean. Here you will taste fresh salads and pizzas and extraordinary cocktails! “Soulatso” is an authentic fish tavern in Skala Eressos, Lesvos Island Greece, and famous for its location right by the sea, its friendly and hospitable service and of course its amazing charcoal-grilled seafood and fish delicacies! Zorba The Buddha prepares for you exceptional breakfast, brunch, smart snacks and dinner, along with excellent coffee, non-alcoholic elixirs and cocktails. You will be one of the lovers of Zorba The Buddha's unique atmosphere. You are most welcome!